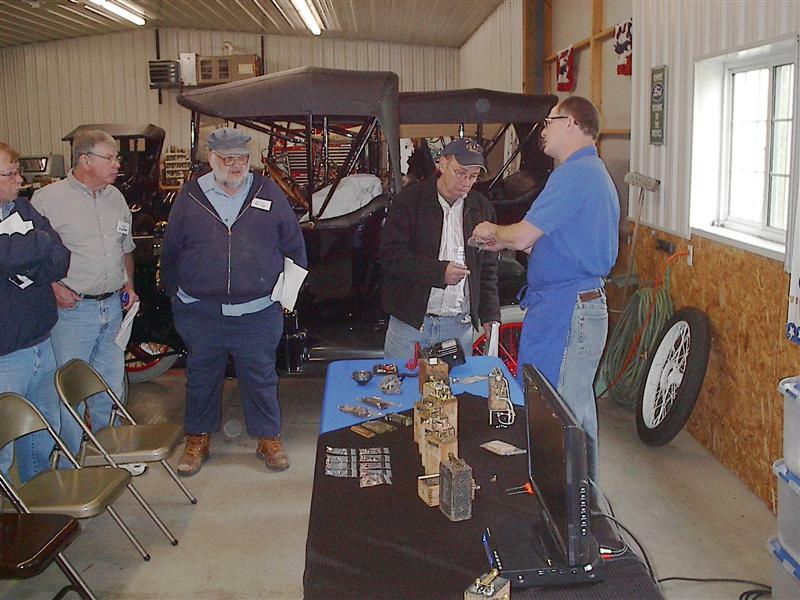 The April meeting was held at Jack Putnam's with 13 members and guests in attendance. The meeting was led by Bob Torbet. We all introduced ourselves to the new members and ran through the past and upcoming events. Bob gave a wrap up of the Florida tour. A treasurers report was given. With all of the Jamboree checks finally cleared, the account was closed. 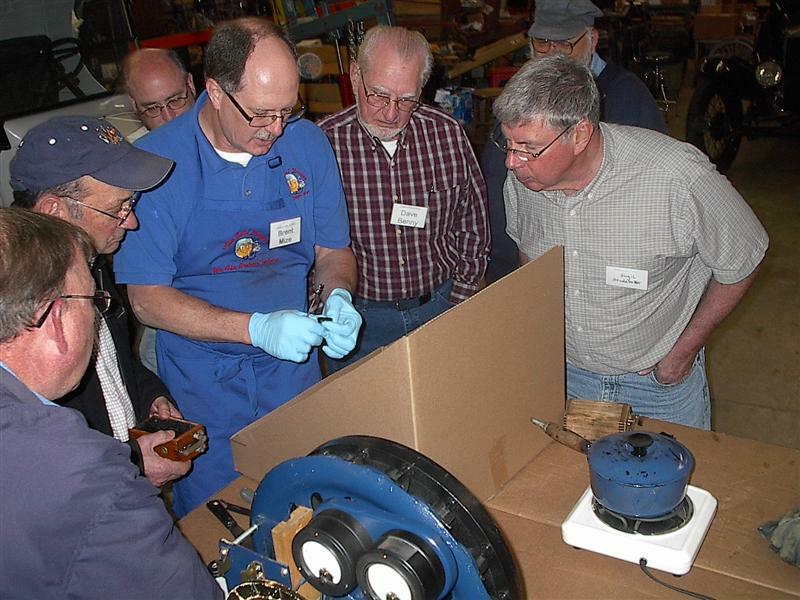 The coil doctor demonstration by Brent Mize to be hosted by our club was discussed. Brent could only provide his services on select Saturdays; so, an e-mail would be sent out when a final decision on a date was made. Brent has taken the help of Ron Patterson and run with it. He is providing a much needed service to the local Model T nuts. 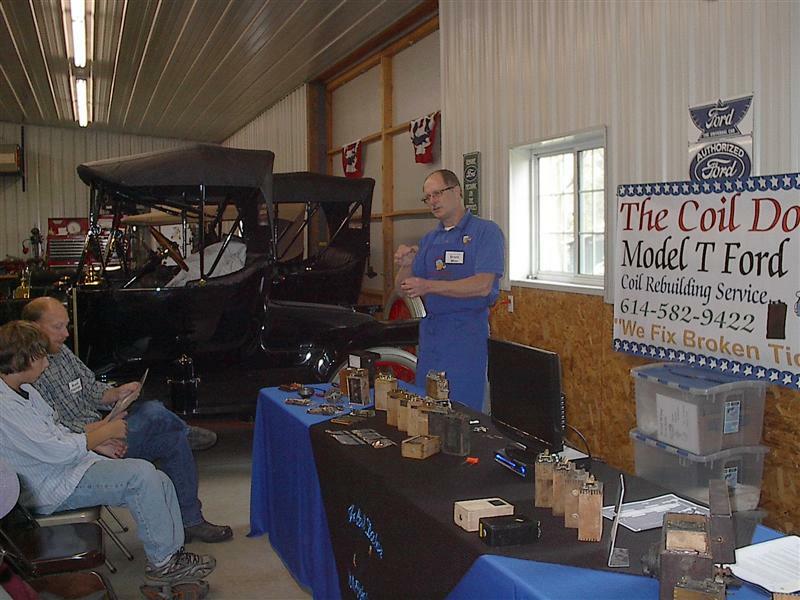 Joe Bell has graciously volunteered to have a line boring tech session for the 3 Model T clubs - Mad River T's, Tickin' T's, and NWO Model T Club. He has asked to have the session in a fairly central location. Kim and Kerry Buckenroth are welcoming everyone to their home on Saturday, June 19th for the gathering. Joe would like to start at 10:00 am and hopes to wrap it up by mid afternoon. Kim and Nancy Mize are planning a ladies outing for the afternoon to the quaint town of Mt. Victory with all of its antique shops. While telling stories of the Florida tour, Bob Torbet conveyed the passing of a great lady. Marcy Zajicek died while attending the tour. She was the widow of Ralph Zajicek. After his death Marcy continued to go on tours and ride with other people. As a result, many people have gotten to know Marcy during tours. Bob said that on this particular tour, she had been riding with a different person every day and was even set to ride with him one day. At the last minute plans changed and she rode with someone else. This may have been a blessing in disguise for Bob. Had she ridden with him, her passing would have been even harder on him than it was. Anyway, Marcy had ridden with someone on the Wednesday tour and was back at the Hotel dancing in the lobby. She excused herself to take a nap before supper and never woke up. She died doing what she loved. Its the best anyone of us could hope for. 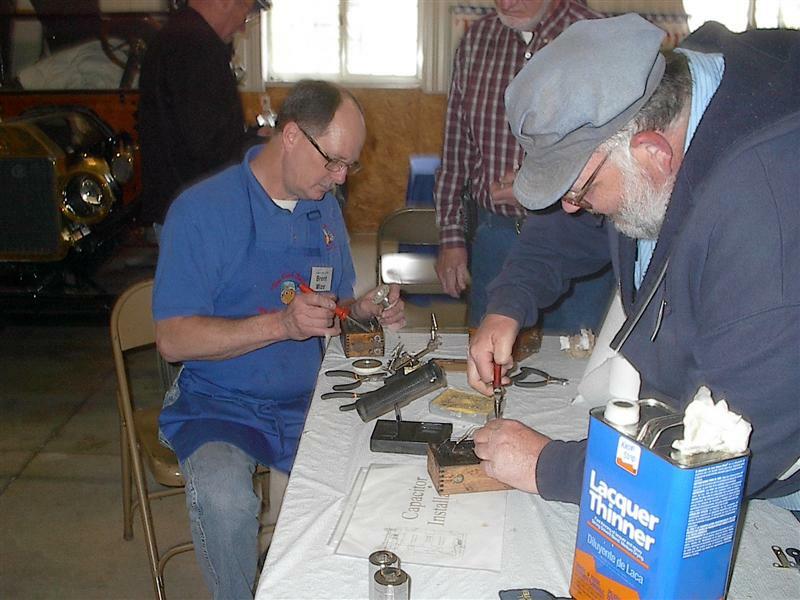 April was the month for the Nortwest Ohio group to get their chance at rebuilding coils. 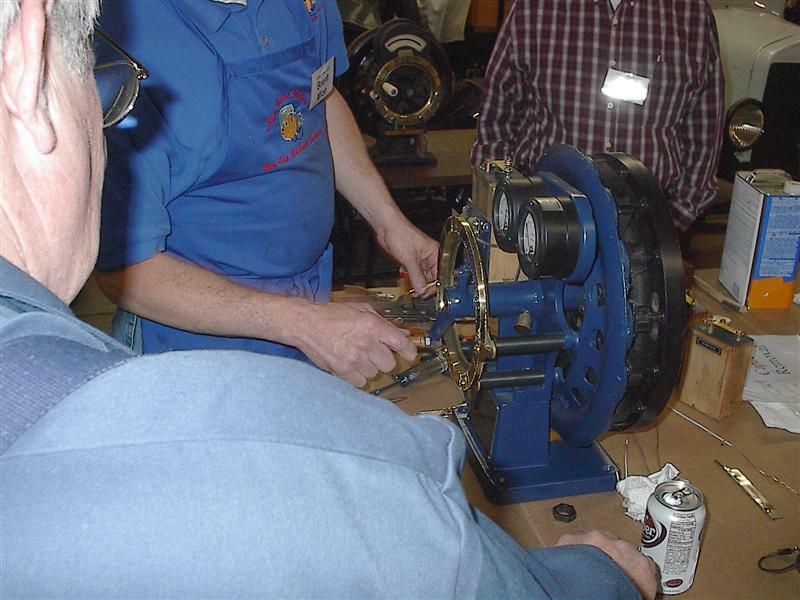 Brent Mize was with us to demonstate how the coil works and what is needed to bring it back into good working condition. He starts in a formal setting for the explaination and then quickly jumps into the hands on part of the program. I've left the photos large so you can see it all. 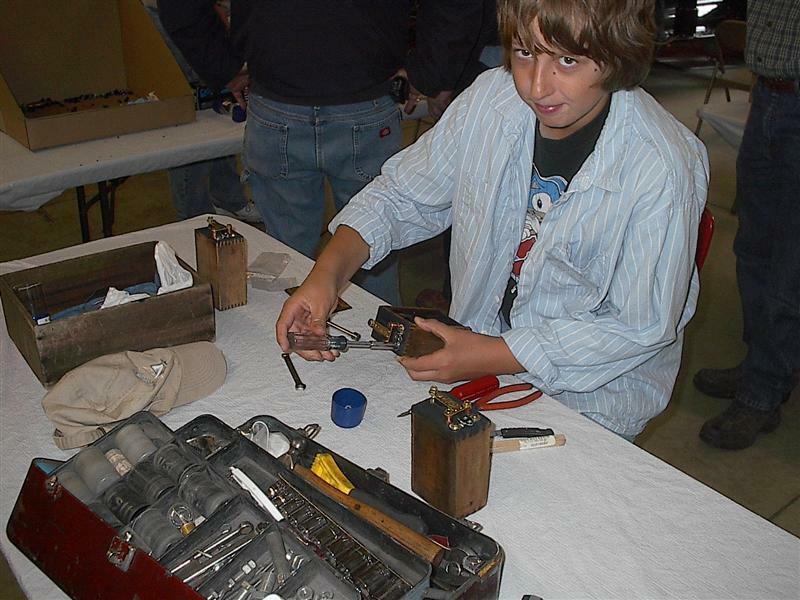 Here we see Brent giving the basics of coil construction and some history of the evolution of the apparatus. Brent was able to keep everyone's attention. There was a good turnout for the tech meeting. Here is a box with the Ford script on it. 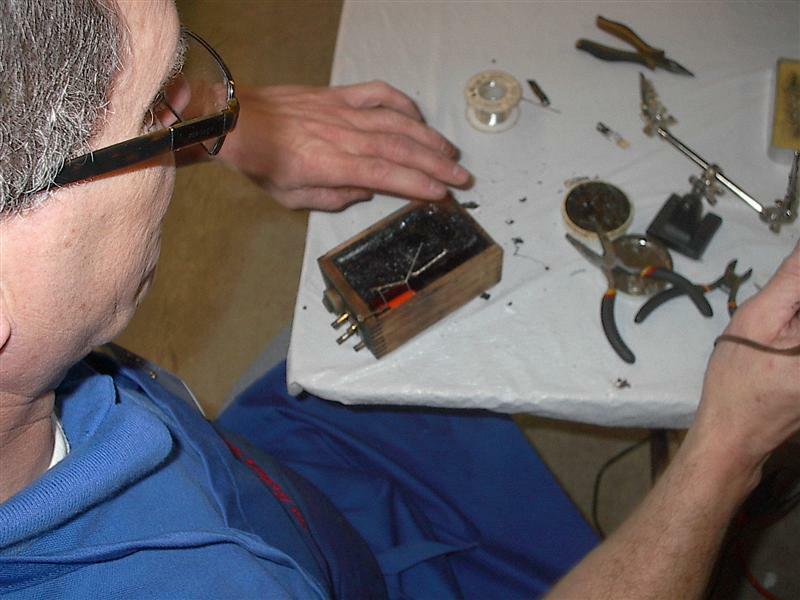 When looking for a good coil to rebuild, make sure that the primary windings are good. We also found out that the best candidates have a side cover that comes off easy. Those pretty varnished coils are a bear to open up. The paper on the table is an x-ray of a coil that has an offending under sized capacitor. The original capacitors had a bad tendency to leak. The voltage must build quickly and then discharge quickly. That is what gives the coil a snap at the sparkplug. 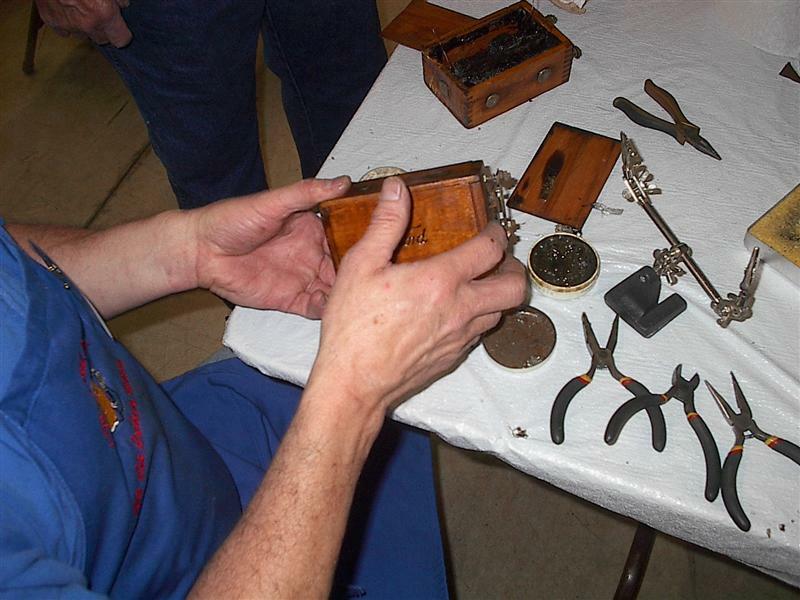 Mr Briggs is getting another coil ready; while, Brent continues to work on a problem coil. The coil is finally ready for the new capacitor to be put in place and soldered in. The leads of the capacitor must be routed in such a way that there is no chance of shorting out the circuit. 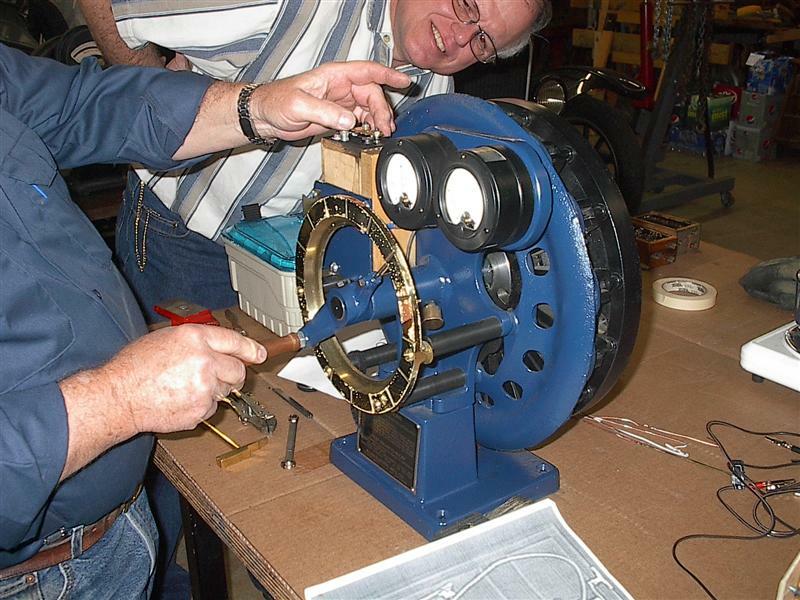 Once this is all in place this coil will have the special brass plate intalled back onto the contacts. These coils require a little special attention to ensure that they do not short out on the top plate. All Model T Clubs want to show off their young people; so, here he is. A complete coil job requires the removal of the old points and the installation of new ones. Here we see the points being set up. This is also a good picture of the tools of the trade. The brass object on the table is the pry hammer that is used to pry the points back up. They are a replica of an original. The vice grips that are next to the hammer are modified with a hole in them to set the cushion spring on the top point. The rivet in the sping needs to be set before it can be used. This is one of those things that most people do not know. If you just order the points from the supplier and install them "as is" you will not have a good running coil. The modified vice grip is one of the secrets to a good coil. This is the part that you really pay for when it comes to having coils rebuilt. 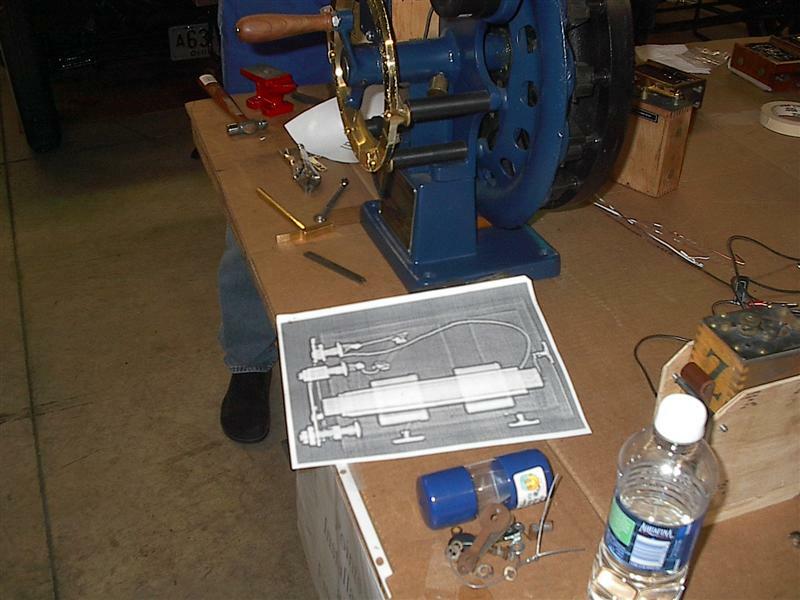 The final setup is a matter of taps and prys that bring everything into perfect allignment. The only way to get good at it is to do a lot of coils. 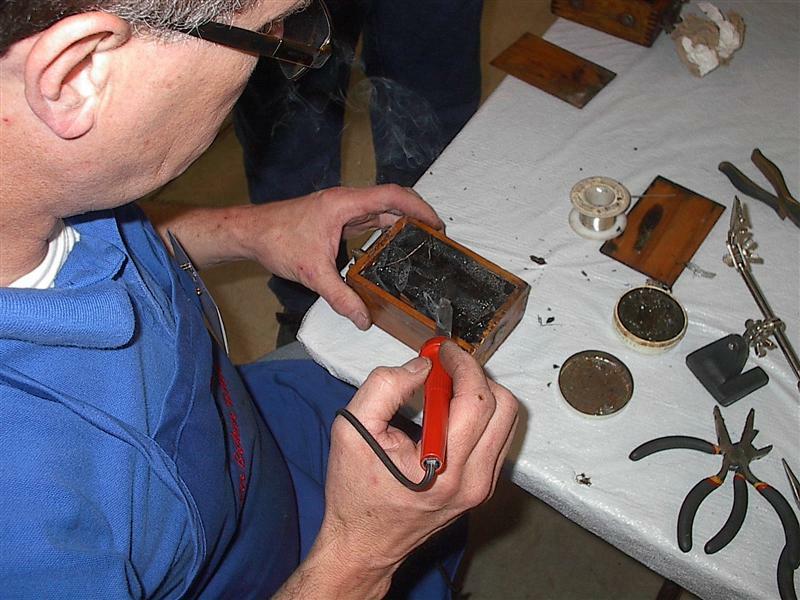 A master coil rebuilder is well worth his price.